Flea infestations are a common problem even in this day and age. It is surprising how many times we are called out to a flea control problem by people that don’t even have any pets, but never the less have a problem with fleas. Its also surprising how many people call us out to a bed bug problem for us to find that it is a flea infestation. We are often asked if we carry out flea fumigation, this is not a treatment that can be carried out in the UK but we do provide an equivalent, safer better treatment. If you have a cat or dog we suggest you contact your vet for a flea treatment for your pet, prior to us attending. Its bedding must be washed at a temperature of at least 50 degrees centigrade as must any other clothing or bedding likely to have been infested. First action to take when trying to control fleas is to thoroughly vacuum your property before we arrive, this means vacuuming behind and under sofas, beds and in all the hard to reach places, don’t forget to throw the debris away in a sealed bag (a good tip is to put a cats flea collar in with the vacuum bag during the vacuuming). If you are not in a position to be able to do this, please advise us before arrival so that we can arrange it as part of the treatment. When we arrive we will want to identify the flea infestation, so if you can catch a few fleas on some sticky tape prior to us arriving this will allow us to proceed without having to carry out a lengthy investigation into the source of the problem. We will with your assistance identify the type of insecticide that is most appropriate for use. Bear in mind that if treating a standard 3 bedroom property of approx 100m2 we will need to use approximately 5 litres of a residual insecticide. The fact that the insecticide has a residual life is important because of the life-cycle of the flea (see below). We will apply this insecticide at the wall floor juncture of all the areas to be treated and beneath all furniture and fittings that can be moved safely and without injury or accident. Those that can’t be moved will be band treated properly. We carry out a thorough treatment including full treatment of stairs, window sills that may have been infested and curtains providing material is robust enough to be treated. On completion of the spray treatment we can also provide a ULV (ultra low volume) treatment, this assists by flushing out any adult fleas into the areas treated with insecticide. We tend to find that people that have had the ULV treatment experience a faster knock-back of the fleas than those that don’t decide to use it. All areas treated should not be vacuumed for two or more weeks, there after frequent vacuuming is also helpful in line with the treatment, but you must immediately dispose of the vacuum bag afterwards. It is likely that post treatment the old bite will occur, these are from young fleas that have just hatched and will succumb to the insecticide shortly and are not in a position to be able to reproduce and lay further eggs. Fleas lay tiny white oval shaped eggs, their larvae are small and pale with bristles covering their worm-like body. While the adult flea’s diet consists solely of blood, the larvae feed on various organic matter. The flea life cycle begins when the female lays after feeding. Adult fleas must feed on blood before they can become capable of reproduction. Eggs are laid in batches of up to 20 or so, usually on the host itself, which then often fall to the ground where the eggs take between two days and two weeks to hatch. Flea larvae emerge from the eggs to feed on any available organic material such as dead insects, feces and vegetable matter. Given an adequate supply of food, larvae should pupate within 1-2 weeks. After going through three larval stages they spin a silken cocoon. After another week or two the adult flea is fully developed and ready to emerge from the cocoon. They may however remain resting during this period until they receive a signal that a host is near – vibrations (including sound), heat and carbon dioxide are all stimuli indicating the probable presence of a host. Once the flea reaches adulthood its primary goal is to find blood – adult fleas must feed on blood in order to reproduce. Adult fleas only have around a week to find food once they emerge, though they can survive two months to a year between meals. Female fleas can lay 500 or more eggs over their life, and feed from a wide variety of warm-blooded vertebrates including dogs, cats, humans, rabbits. Flea bites generally result in the formation of a slightly-raised swollen itching spot with a single puncture point at the centre. The bites often appear in clusters or lines of two bites, and can remain itchy and inflamed for up to several weeks afterwards. Characteristics: Adults 1-8mm long; brownish in colour, body laterally compressed (streamlined) and covered with backward-directed bristles; reduction or loss of eyes; piercing mouth parts; no wings, although transitory wing buds may appear in pupae of some species; muscular legs, with hind limbs adapted for jumping; metamorphosis complete with egg, larval, pupal and adult stages. Adults, 2-3.25mm long; forepart of head longer than it is high; prominent pronotal and genal combs (first teeth of genal comb nearly as long as second); basal section of legs equipped with stout spines. in commercial and institutional premises derive from feral cats. Adults, 2-3.25mm long; forepart of head as long as it is high; prominent pronotal and genal combs (first teeth of genal comb only about half as long as second); basal section of legs equipped with stout spines. Host/habitat: especially members of Canidae family, also domestic animals and man; found particularly in host bedding. Adults, 2-3.5mm long; no pronotal or genal comb; basal section of legs equipped with stout spines. Host/habitat: especially man, but will also breed on pigs, hedgehogs, foxes and badgers; found in homes, usually in bedrooms. Adults, 1.5-2.25mm long; pronotal and genal combs, the latter with five vertically arranged rounded spines; basal section of legs equipped with stout spines. and attach themselves to the host, especially around the ears and head. Adults, 1.5-2.5mm long; no pronotal or genal comb; row of bristles along back of head; basal section of legs equipped with stout spines. Host/habitat: various rodents, but will also attack man; found especially around ports. Adults, 2-3.5mm long; genal comb of 1-3 short spines; pronotal comb of 2-9 spines. Adults 2-2.5mm long; no head folds to retain antennae; pronotal comb with more than 24 teeth; no genal comb, no spines on basal section of legs. season, migrating from the nests when fledglings leave. Often originating from birds’ nests in roof spaces. Adults 3.5-6mm long; genal comb of 9-12 spines; pronotal comb of 42-58 spines. Host/habitat: associated with moles; also found in gardens and outbuildings. Adult fleas live exclusively as parasites of warmblooded animals, especially mammals, although birds may also be attacked. Whilst they show a certain degree of host preference, fleas are by no means specific and will feed on other animals in the absence of the normal host. In fact they tend to be more nest than host specific, for whilst the adults may feed on the blood of a variety of animals the larvae require more precise conditions which are associated with the habitats and nesting habits of the hosts rather than the characteristics of their blood. Cat fleas are responsible for many flea infestations, the remainder being attributable to a variety of bird and animal species. Human flea Pulex irritans infestations are now uncommon. The significance of Ctenocephalides felisis (cat & dog fleas) explained by the increased number of pets being kept and the tendency for their beds to be neglected during cleaning. Wall-to-wall carpeting also provides a relatively undisturbed environment for flea larvae to develop, whilst the spread of central heating has served to ensure ideal temperature conditions. The most serious infection which they can spread is bubonic plague, transmitted to man by rodent fleas(Xenopsylla cheopis)which carry the causative bacillus from infected rats. In the past rodent fleas have been responsible for serious epidemics of the disease, notably the Great Plague of London in 1665. Rodent fleas may also carry murine typhus and, because of their readiness to attack humans as well as rats, are probably the major flea vector of disease. The Dog flea is an intermediate host of the Dog tapeworm (Dipylidium caninum), whose vertebrate host is usually the dog (occasionally the cat) but which can sometimes be transmitted to man. 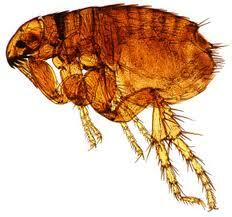 In Europe fleas are not generally responsible for the transmission of disease. However, they are still objectionable because of the bites they inflict and the deep-rooted social stigma attached to humans with flea infestations. Occasionally psychological problems arise with the induction of delusory parasitosis, in which the victim imagines he is infested with ectoparasites. Flea bites are identified as a tiny dark red spot surrounded by a reddened area. The bite persists for one or two days and is intensely irritating. First bites are not generally liable to cause serious reactions, but they may lead to hypersensitivity. Reactions are usually delayed following regular biting over a long period; there will then follow a period when reactions are immediate. The cycle then repeats until a state of non-reactivity – immunity – is achieved. the black and white – salt and pepper – effect associated with flea infestations. Four to eight eggs are laid after each blood meal and a single female may produce 800-1000 eggs during her lifetime, which may be as long as two years. The eggs hatch in about one week to give white, threadlike, legless larvae 1.5mm long. These are distinguished by an identifiable, usually brownish head without eyes; jaws adapted for biting; three thoracic segments and 10 abdominal segments all equipped with bristles; and peg-like processes on the terminal abdominal segment. The larvae thrive in dark, humid places such as animal bedding and carpet fluff, and feed on organic debris and adult flea excrement. The latter forms a valuable part of the diet as a source of blood, which some larvae, while not attacking the host, require for their development. Larvae may also be predacious, living on small and weak arthropods. Cats’ bedding may support a flea population of 8000 immature and 2000 adult forms. A typical flea infestation may be composed of adults 5%, larvae 35%, pupae 10% and eggs 50%. phase is the quiescent stage and the flea may overwinter in this state. The adult flea will then be stimulated to emerge by the vibrations set up by a passing host. This explains the occasional mass attacks which take place in deserted premises. The development cycle from egg to adult is normally completed in 4 weeks but at low temperatures will take much longer. To download a Flea Advice Sheet please follow this link Fleas Treatment Advice.